It's not only the visual changes brought on by the Material Design paradigm that the new "L" Android release will bring to the table, there are revolutionary changes under the Android hood, too. For starters, we are moving from the current aging Dalvik compiler to the efficient ART, which will make Android L truly cross-platform on ARM, x86 and MIPS, i.e. everywhere. The ART compiler will significantly optimize memory work and app loading times, too, so Google is promising up to two times faster performance at times. In addition, ART is entirely 64-bit, so it can take advantage of new apps written from the groundup for 64-bit processing architecture, like the new ARM Cortex-A57 processors. It will also allow much larger RAM memory quantities to be addressed, so seeing Android devices with more than 3 GB of RAM is not out of the question. All of these improvements are coming for free, of course, as soon as the new Android L hits your handset. Watch all the performance improvements explained in the keynote below from the 1:02 mark onwards. And yet my Nexus 10 will only run ART when I use CM or a 3rd party firmware... (and its blazing, but nothing runs as well as Stock sadly) Of course the N10 is not 64bit, but saying art is entirely 64bit... well, apparently ITS NOT! So... Because you're using the beta version of the ART runtime in KK, you're saying that it's not entirely 64-bit? You are aware that 32-bit instructions can be run on 64-bit machines right? Also, it's still in beta on KK and can be fairly unstable with some apps. It's cool to try out and all but Dalvik is still more stable in KK even if it is slower. My point still stands, "ART is entirely 64-bit" is incorrect. well no not really, because there is two different installs, 32bit and 64bit. It is not one install like android L. So ye kind of has a 'point'. Though i dont see what it is. Other than being a bigger install file and footprint on the device itself. will the 64bit help devices like the S4, Z1 or any 32bit phone in terms of speed or just the new 64 bit ones? Probably both, since people even now are using the new ART runtime and are seeing some speed improvements. ART will help, but there are no Android devices that can run 64-bit anything. Typical arrogant Android fan spotted. Now I'm seriously confused!! Android L is official or not? 64-Bit ? I though it useless with Devices with RAM less than 4 GB !! Now it's awesome eh ? "It will also allow much larger RAM memory quantities to be addressed" iGeek read the article before you comment please. The first 64-bit android devices will have 1-2 GB of RAM and possibly never get updated to this android. So if all android fans think that Apple top to bottom 64-bit integration is rated as "gimmick" what you will say on that 64-bit platform mess coming to android ? Have you seen a device with Android L that had less than 4gb of ram? No? So you're talking out your arse? Yes. Have you seen a device with Android L that had MORE than 4gb of ram? No? So you're talking out your arse? Yes. Has anyone seen a device with Android L...? Yes the demo unit ;) The Nexus 5s ! Note : They don't have 4GB of RAM neither 64 bit Processor so I don't see what you are trying to say ? That's the point - it doesn't exist, so your original comment was, well...dumb. His point is that people dissed Apple for making iOS 64 bit, mainly for being useless with less than 4 GB. 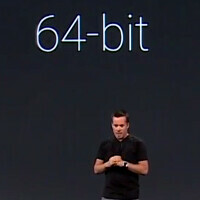 Now that Google announces 64 bit, it's awesome, even when there aren't devices with 4 GB yet. The OS isn't even out yet until the fall. There are already rumors of 4GB Android phones on the Horizon. It is now up to the manufacturers to include 4GB of ram or more in a mobile phone as the OS will now support it. On top of that, this update is more than just for mobile phones. ART supports all platforms including x86 devices which means you could see it on a laptop, and or as a platform to replace ChromeOS and more. Those devices certainly do support 4GB of ram. Many devices outside of mobile phones run Android. Can you say the same for Apple? Apple most certainly did release a x64 bit phone strictly for marketing purposes. Then he has no point. Apple was dissed for making the PROCESSOR 64 bit without giving the PROCESSOR 4 GB of RAM....not IOS.